Long Lost Blues is required reading for lovers of the blues and historians of American popular music. “Sheet music is not my thing” is not a valid excuse for ignoring it, because Muir has succeeded in pushing back permanently the point of our historical certainty about early blues from 1920 to 1910. Furthermore, he provides new musically informed thoughts about proto-blues and the earliest datable blues of the 1890s and the 1900s, and they demand the most considerate of scholarly responses. Muir’s Long Lost Blues is a work of extraordinary scholarship and a valuable illumination of a largely forgotten corner of American music. [Long Lost Blues is] an extremely gripping and far-reaching study of a major piece of early jazz history. Read the full review (in German) here. Muir’s study is fascinating, with implications larger than the history of blues in its examination of the interplay between orally passed-along folk music (which was where the blues stood at the dawn of the 20th century) and popular music transmitted through commercial media. Long Lost Blues is both scholarly and highly readable. For me, it offered a fascinating view of the blues as a serious and genuine malady. Peter Muir … treated an audience at the Chappaqua Library to an intricate mix of historical lecture and performances. Long Lost Blues is likely to become an important part of the historical literature of both blues and American popular music as a whole. Muir is to be credited for shining a spotlight on this critical period that has been, as he rightly notes, largely neglected in blues discourses. I would hope that this study will lead to a further reassessment of blues, both in terms of its historical narrative and for what blues means within the context of a popular audience that is deeply intertwined with debates over authorship, authenticity and identity. Muir’s work will be of great benefit and interest to anyone concerned with blues, from musicologists to casual fans, and is therefore strongly recommended. Ken Prouty, Fontes Artae Musicae, 58/1, pp. 101-103. Although [Long Lost Blues] advertises itself as a musicological study…, it scores highly in being more populist in its presentation and ability to hold the lay reader’s attention…chock-full of insights that one would be hard-pushed to find anywhere else. Long Lost Blues is a fascinating and ground-breaking exploration of largely unexplored music terrain, an intelligent, well-documented, and highly readable journey through the intersection of popular and folk music in the early 1900s…It is highly recommended. Tim Brooks, Journal of the Society for American Music, 5/2 (May 2011), 279-282. Long Lost Blues is a remarkable achievement which stands on the twin pillars of exhaustive research and acute musical analysis. 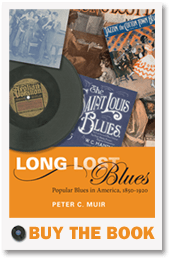 Peter C. Muir’s book Long Lost Blues is a milestone. All music lovers are indebted to his painstaking search and diligent analysis, which will lead to a better understanding of the most important music of the 20th century. Muir’s revealing book contributes significantly to understanding how sheet music and the pop music industry influenced the blues. An important work. This fascinating work discusses the genesis and introduction of a minority music genre into mainstream culture in a way that is impossible to ignore, given the importance of blues connections to other genres. Essential reading for anyone interested in American music. …breaks new ground in blues research. A fascinating book which is highly readable, despite its academic approach. A study like Muir’s has been overdue for decades. He has done a thorough job and presents the results of his pioneering research in a highly readable manner.